3,5 mm (US 4) needles or any needle size which gives you the desired fabric. want to, you can switch into bigger needle size when you start knitting the lace section. 135 cm across by 50 cm down. 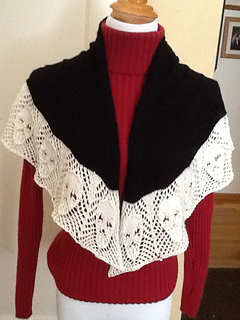 abreKNITS knitted a shallower version of the shawl, you can see her project here. There are notes on the pattern how to knit her version of the shawl.